A very shiny Ford 27 T Coupe Hot Rod. My first listing with a truly glossy finish. I airbrushed with Behr Oops paint and top coated it with a clear acrylic glaze from a rattle can. The Rust-Oleum Triple Thick Glaze was really difficult for me to get smooth in the conditions I had to work with. With the slightest breeze over spray would blow around to the other side and stick causing a very rough surface that had to cure over night and be sanded smooth and resprayed. 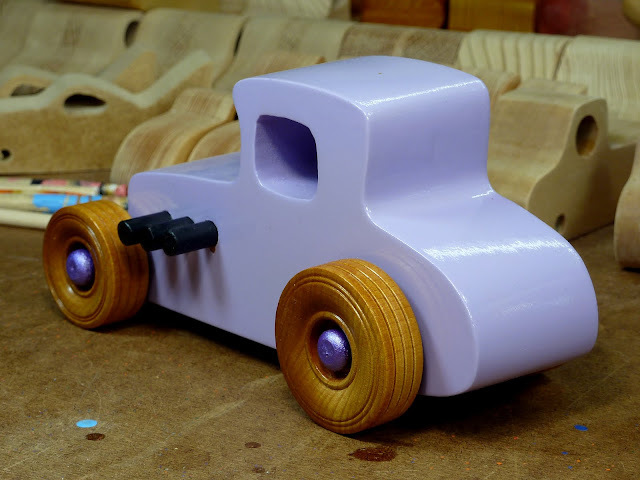 In addition, it had to be sprayed fairly wet to get a smooth coat meaning there was I high risk of getting a run or sag in the finish that I had to sand and recoat, But when it all came together the car looked like it was coated with glass. A real spray booth would have been a big help. The Triple Thick Glaze also took a long time to cure hard enough to be handled much. The next day after spraying it was still soft enough the surface would dent easily. While I freely admit that this could be at least partly my fault, I had no such issues with the Krylon. One coat and it was done. There are two different brands and shades of paint used here. Not intentionally. Someone decided ti would be OK to thin the paint directly in the can and the dark pink was unusable when I got it out. I learned since then that you should never thin paint you want to keep with tap water. Chemicals in the water can react with the paint and cause it to do strange things. Like set up hard inside the can. Forget keeping paint thined with other chemicals. That will not happen again. Not to me anyway. 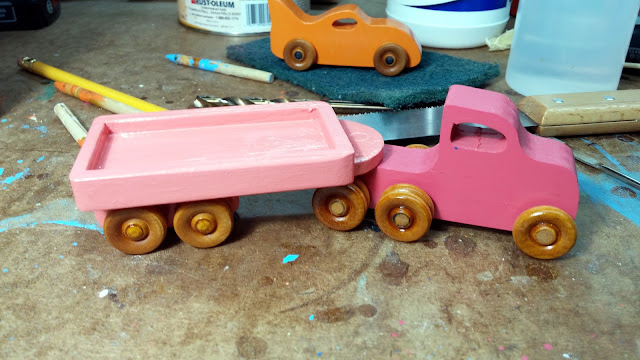 The lighter pink on the trailer is Glidden and the cab is painted with Behr. Both are Oops paint from Home Depot. The Glidden paint on the trailer is flat so I coated it with clear shellac to brighten it up a bit and add a bit of durability. 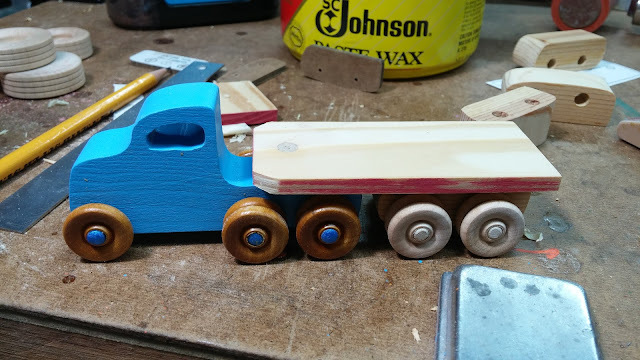 The wheels on the cab are my first "successful" attempt at flush cutting the axles. Successful in that it was still usable when I got done. The cab is made from BC plywood junk from home depot One of two that made it far enough to get painted. Once again the trailer is southern yellow pine with a spruce under carriage. This is the car hauler trailer. 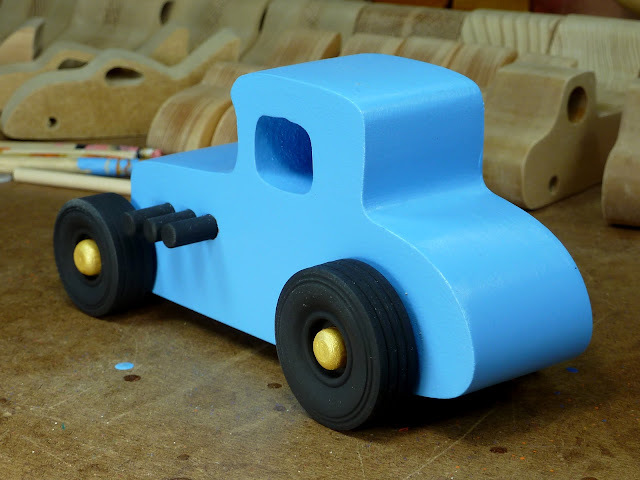 The play Pal cars stay on the trailer up tp about 45 degrees and all the hot wheels cars I tested did the same. Even the Play Pal Van with its slightly longer wheel base fits. Pure luck. I made no attempt to measure for the trailer length. After I made my first one I realized that the length would not matter in most cases unless it was crazy long. I just squared the ends and made a trailer. 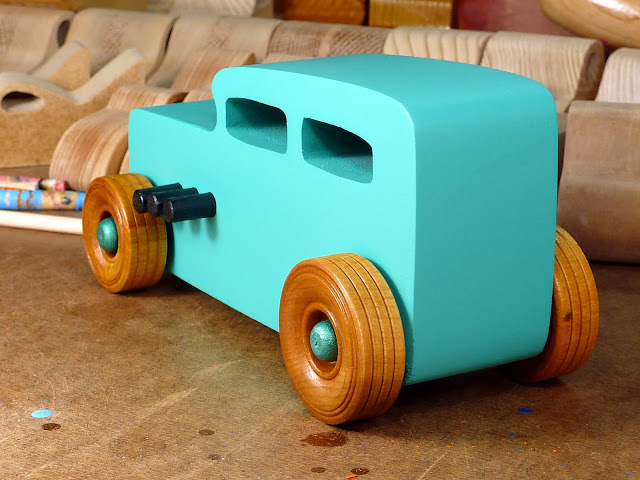 The trailer beds are made from wood left from building a rocking horse. All of the trailers are different lengths. 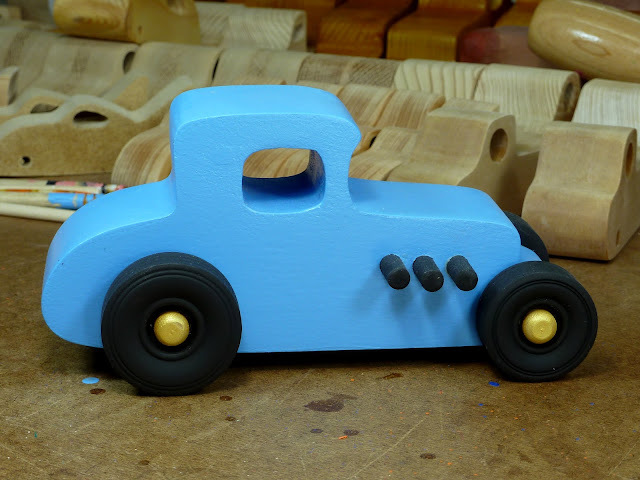 One of the nice thing about making small toys is that there is little that goes to waste. This one is pretty much the same as version 2 as far as the paint goes. I added a low rail around the edge of the bed to keep things from sliding or rolling off. 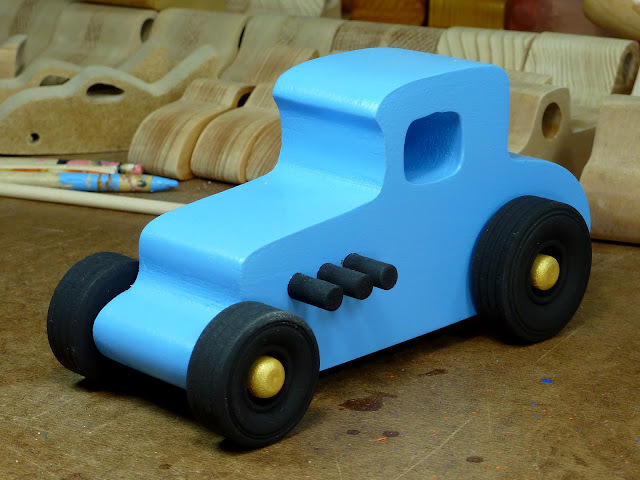 It works ok for small toys and blocks but most of the Hot Wheels cars we have will go over the edge easily. Small wood blocks stay on it quite well. 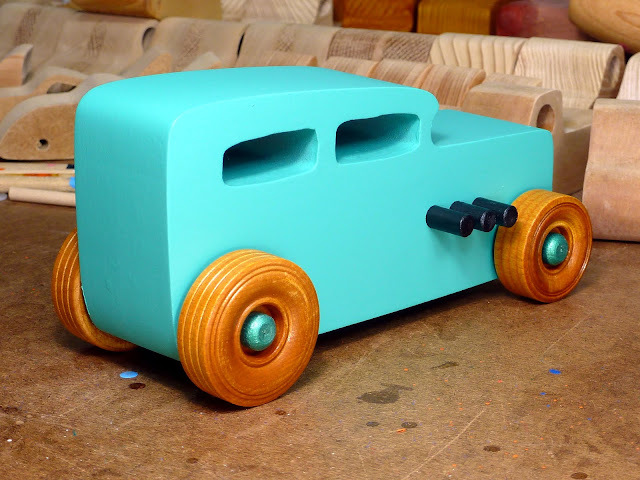 The cab is made from BC plywood. Another experiment. 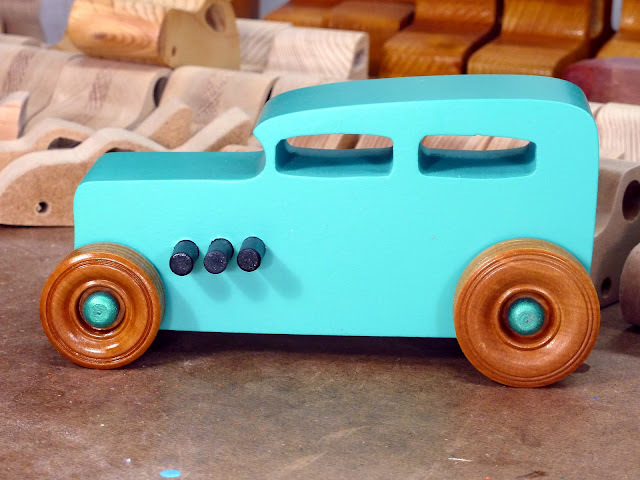 You can make these from BC plywood but if you have another choice don't use it. I tossed several of these in the trash because of voids in the plywood and laminations separating. The trailer bed is constructed from southern yellow pine with a spruce undercarriage. I cut the rails using a Grr-Ripper and my Shopsmith bandsaw. The rear axles on the cab are flush cut. I cut them longer than needed and after they are dry I used a flush cutting saw to trim them and added a touch of shellac. When making the axles to do this you need to have them sticking out at least 2 or three times the width of the saw kerf or your going to have a tough time getting a smooth cut. It's not the easiest thing to do I ruined a few wheels getting the hang of it. This one is a bit rougher than I would like but I got tired of messing with the plywood. This was before my grandson decided my experimental trucks were his. He took off with one of them before I had thought about making trailers. I had to sneak it back into the shop to drill the hitch hole. 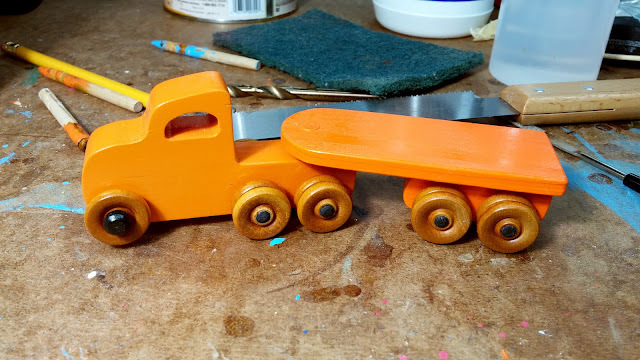 The photo doesn't realy do justice to the colors on this toy truck. There are two shades of orange and they are both quite bright. Not Florescent orange bright but very bright. In daylight or 6500K+ LEDs it practically screams orange. 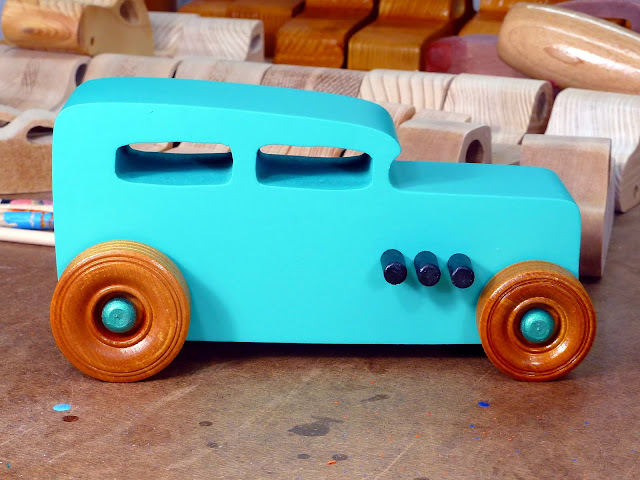 The cab is made of pine and sprayed with two coats of Krylon with a light sanding between coats with 220 grit sand paper. Just sanded enough to knock of the fuzz. 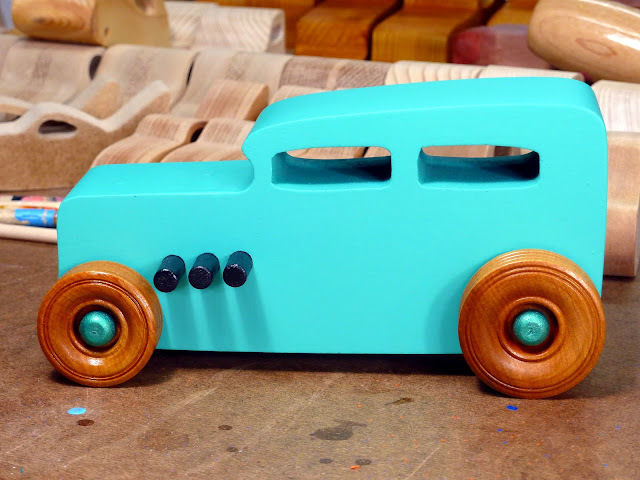 The trailer bed is southern yellow pine and the under carriage is made from spruce. The paint is two coats of Anita's Acrylic Craft Paint. Applied with a brush. Again sanded in between to smooth things out just a little. 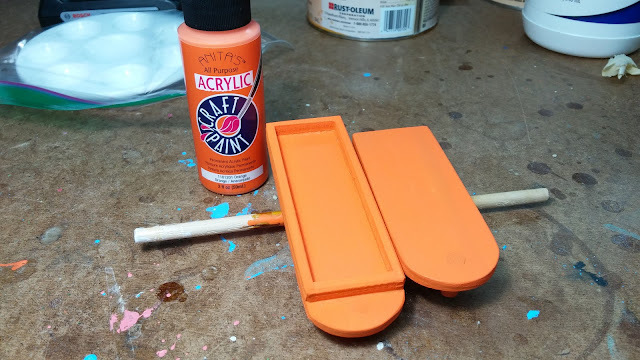 This paint covers very well for an orange paint. I was quite surprised. 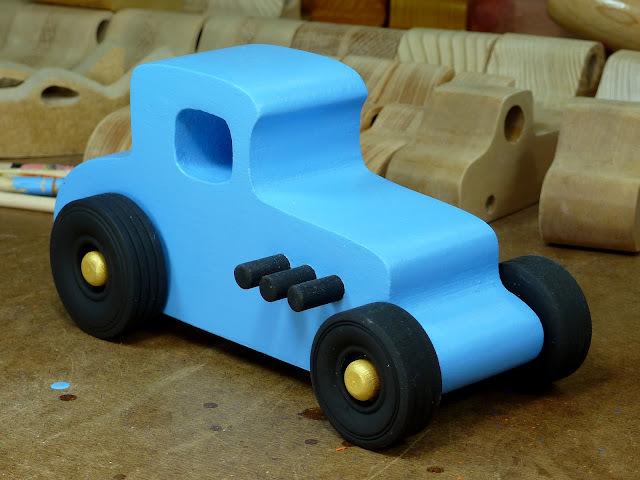 It has the typical dull flat finish most craft paints have. To give it a little more durability and shine it up a bit I added a top coat of Clear Bull's Eye Shellac. The shellac really popped the color. 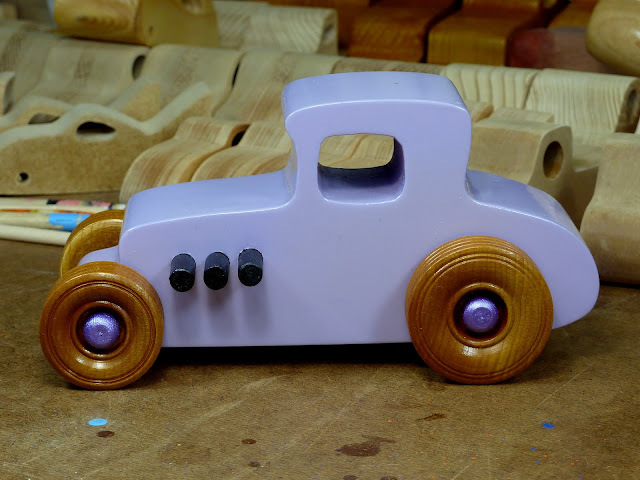 All of the wheels are brushed on amber shellac. One coat of as much shellac as they will take. 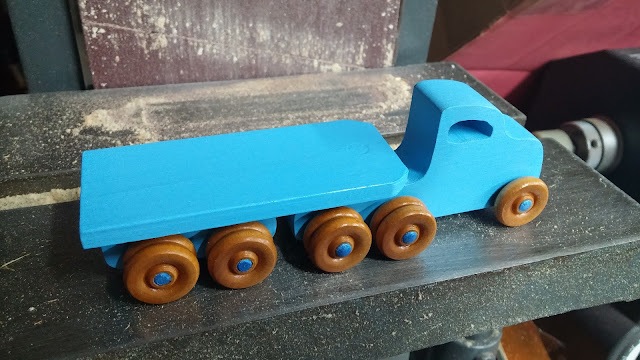 The axles with the dual wheels are painted on the ends with black acrylic craft paint. These are measured and cut to fit. 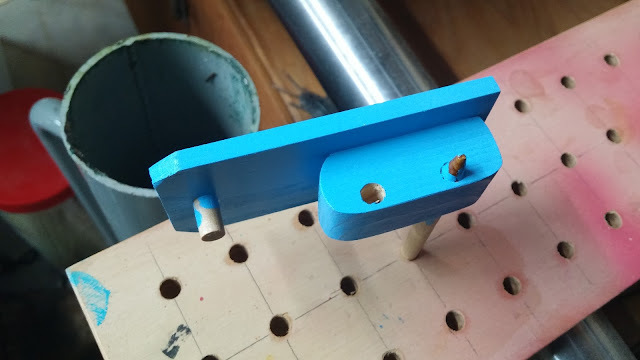 The ends are then sanded round and painted. 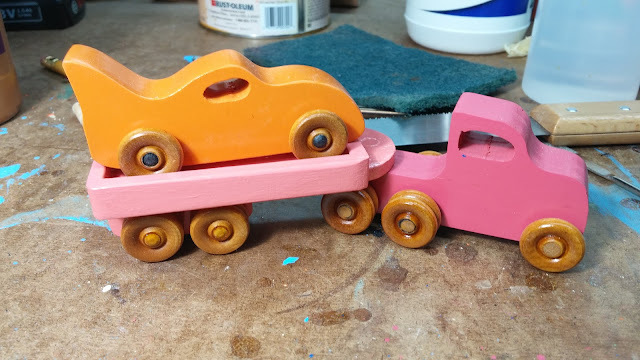 When the paint is dry I glue on one pair of wheels per axle and alow the glue to cure before inserting the axles and adding the second pair of wheels. I could do them all at once but for me this works much better. 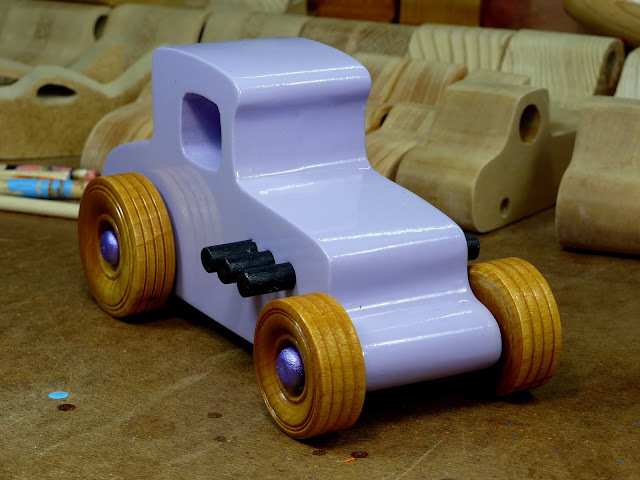 If I mess up and get a bit of glue in the wrong place the wheels or the axle could get glued to the body of the toy. Its very easy to mess this up when gluing all the wheels at once. 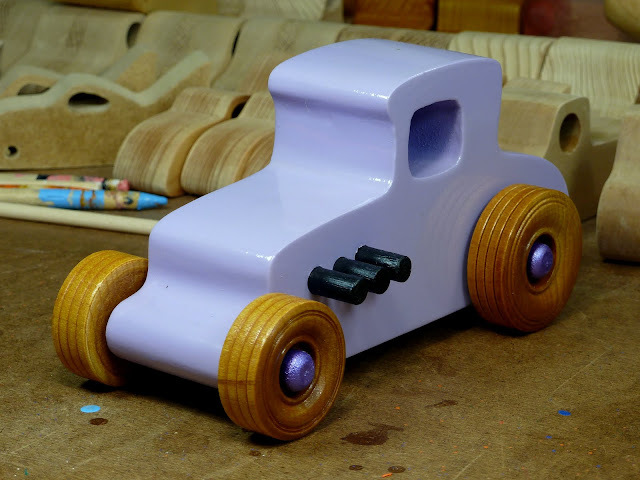 The front wheels have axle pegs painted with black acrylic craft paint and coated with clear shellac. I really like the look of the hubs on a truck and intended to put them all round. Unfortunately, during the dry fit I discovered that they were not long enough to use for dual wheels. Made from MDF, primed, painted with Behr Oops paint from Home Depot and top coated with Krylon Crystal Clear Acrylic. Exhausts pipes are brush painted with flat black acrylic craft paint and top coated with clear shellac. The birch hardwood wheels are finished with amber shellac putting on as much shellac as they will soak up in one coat. The metallic green hubs are painted with acrylic craft paint and top coated with clear shellac. The green pain was applied with an air brush. 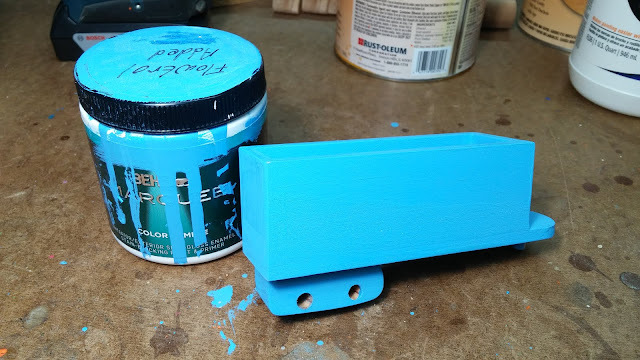 Primer was from a rattle can as was the top coat every thing else i applied with a brush. 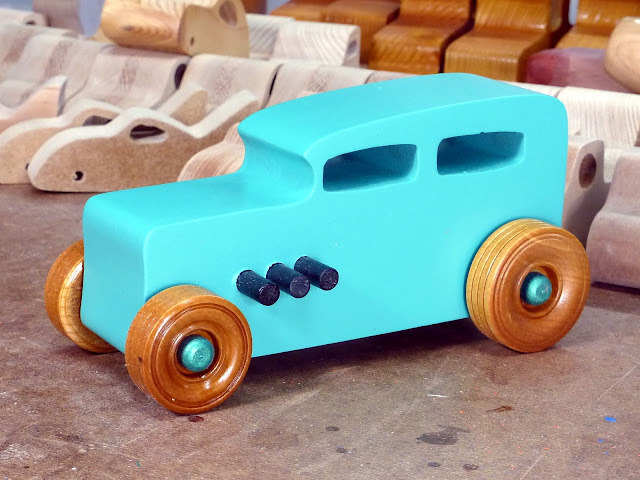 This Hot Rod toy car has the same basic construction as the previous green 32 Ford Sedan. The only difference is the top coat is Krylon, Crystal Clear Acrylic Flat finish. It looks a little bit different and feels different to the touch. I think I prefer the satin finish. 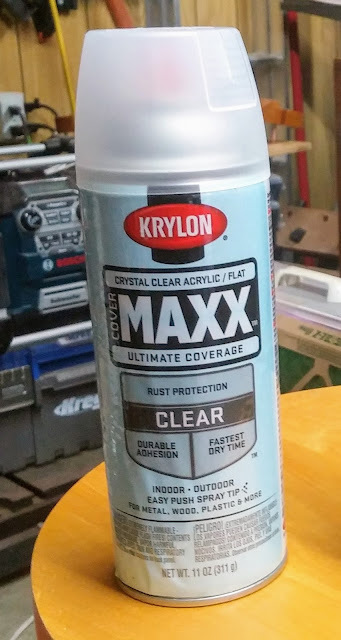 The Krylon finishes are really clear and don't change the color. This one is a straggler. The first three in this set have been on Etsy for a while. When I photographed the set of toy cars I noticed a problem with the pain that I just had to fix. If you want to see all the defects in your toys will show up as glaring errors. This is for sale in my Etsy store. This box trailer version was painted with blue Behr Oops paint from Home Depot with just a little Flowtrol added. The Flowtrol slows drying and helps the paint to flow out smoother. Flowtrol doesn't help much when I painting on raw wood with a brush but it helps when spraying on smooth surfaces with an airbrush. House paint doesn't raise the grain near as much as the craft paint does. I also seems to be more durable than the craft paint. It doesn't rub off like some craft paints. It is cheap and available in a wide array of colors. Of course oops paint is only available in the colors they have messed up. I check the paint department at Home Depot every time I'm in the store looking for bright colors. This can of paint cost fifty cents. 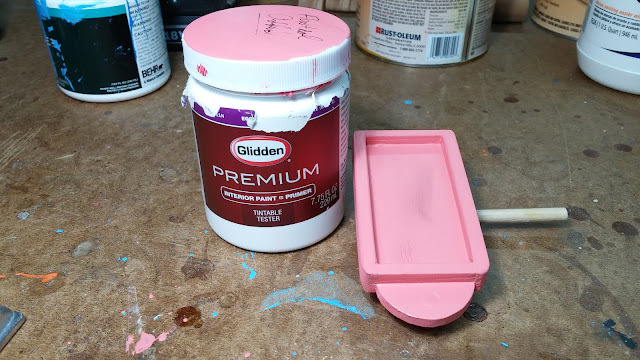 I sometimes see sample jars of Glidden Oops paint at my local Home Depot. I only have 3 cans of it on hand. This was a lighter pink than the Behr I have been using and I wasn't expecting it to cover as well as it did. The trailer in the photo has one coat of paint on bare wood. It needs second coat but that will do it. Sometimes when you buy oops paint the color on the out side of the can doesn't quite match the actual paint color. I think they just don't bother to mix it well before they paint the outside of the can. This was one of those. It was much lighter after it was thoroughly mixed. I added Flowtrol to this can of paint to help it flow out better. I add about 1 tablespoon or so unmeasured. I just pour what looks like a good amount and mix it up. I always mark the can so I'll know if I have added it. 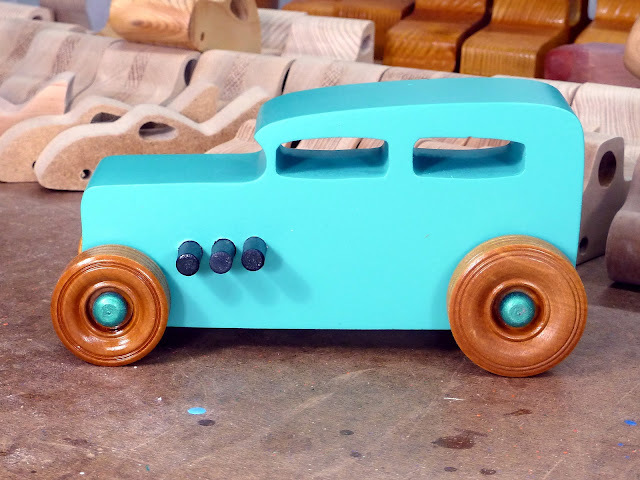 This trailer is designed so a standard Play Pall toy car, truck, or van/bus will fit on the trailer and not roll off to easy. It's not elegant but it works. It also keeps hot wheels and match box cars in place . 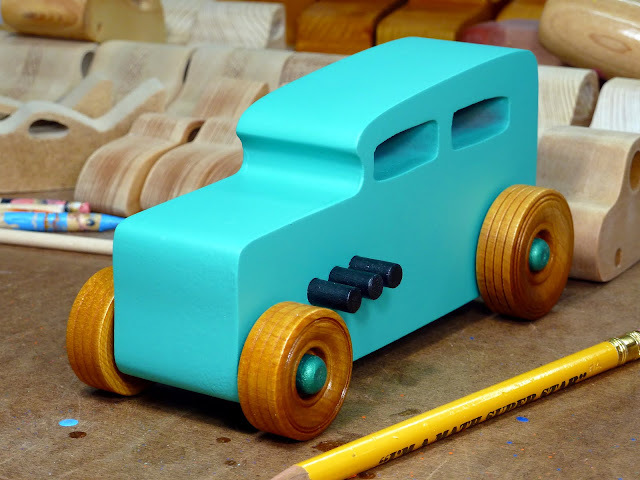 A toy car hauler. I painted these two trailers with Anita's All Purpose Acrylic Craft Paint. I didn't use a primer or sealer coat of any kind. The paint was applied with a brush just as it came from the bottle. This is the first coat of paint. I was quite surprised at how well it covered the wood. The orange paints I have used in the past did not cover well at all. Usually requiring multiple coats to get to the point where I could not see through it. It raises the grain a lot but I expected this. Water based finishes of any kind will raise the grain. 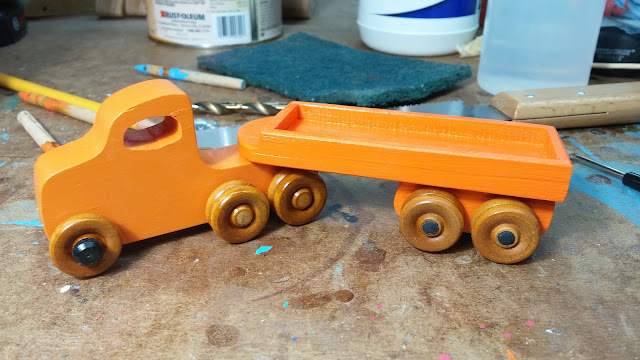 I finished a Play Pal truck test build last night. ﻿I gave it to my grandson Odin last night. He is my quality assurance tester. If he likes it we make more. I think he likes this one. He slept with it all night last night. I made a few changes from the original plans. The bed is wider. The same width as the 2x4 it is cut from. I could not see any reason to make it narrower and the covers the dual wheels perfectly. I used eighteen wheels instead of ten the plan called for. An eighteen wheeler with only ten wheels just doesn't look right to me. My grandson grabbed the first cab he saw with the dual wheels and refused to give it back. 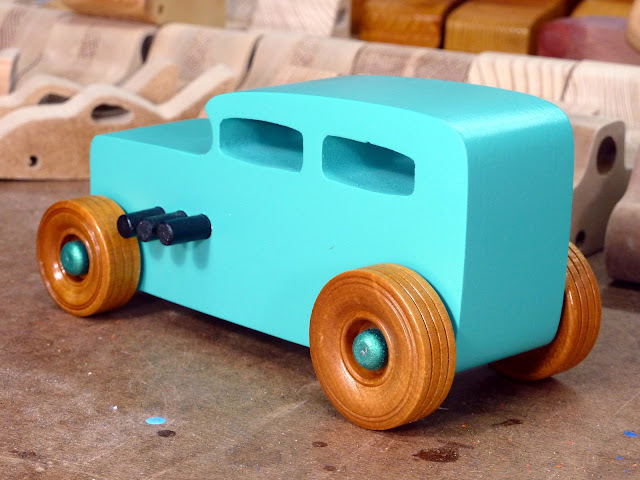 He has a cab in his toy box without a trailer. 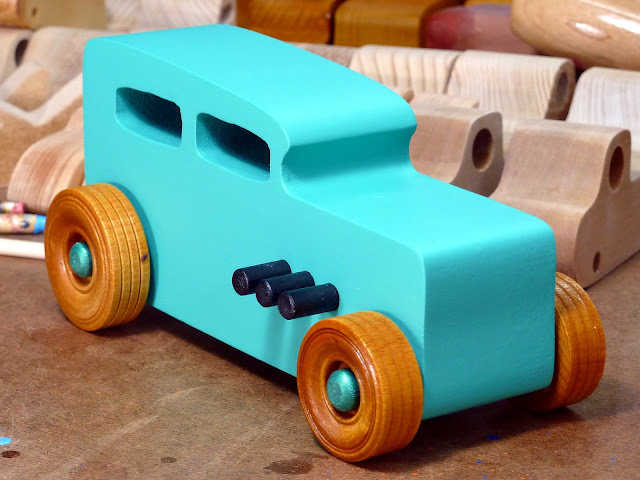 I made the body and trailer are cut from pine and spruce leftover from other projects. The trailer bed and cab are pine and the trailer undercarriage is spruce. 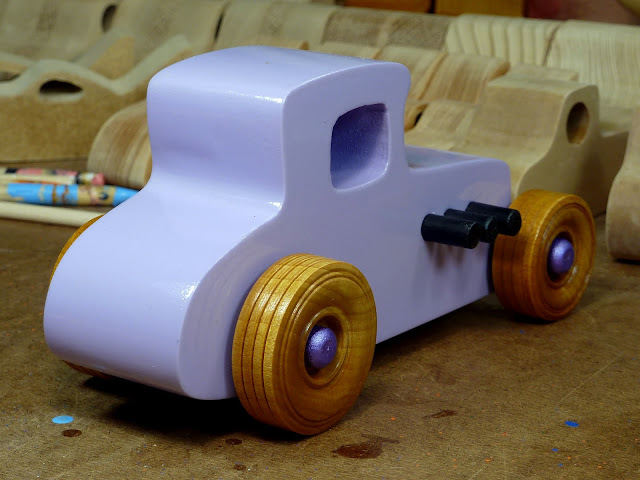 The wheels are 3/4 inch birch hardwood purchased from Craft Parts. The axles are birch. The body and trailer are painted with Behr Oops paint I get from my local Home Depot. Two coats with a light sanding between coats to knock the fuzzies off. 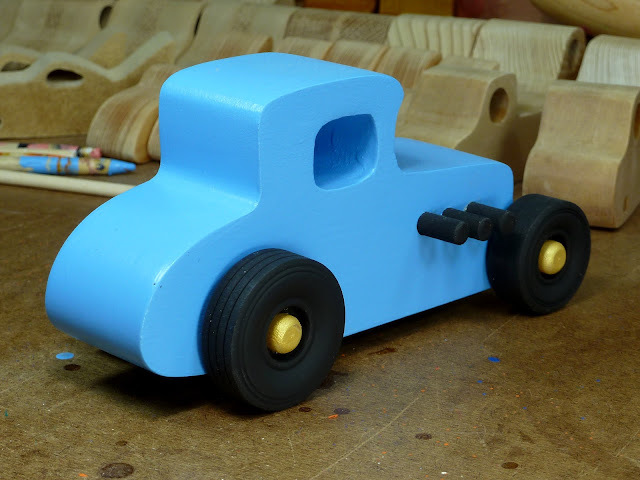 The axle ends are rounded on with sandpaper and painted with metallic blue acrylic craft paint. 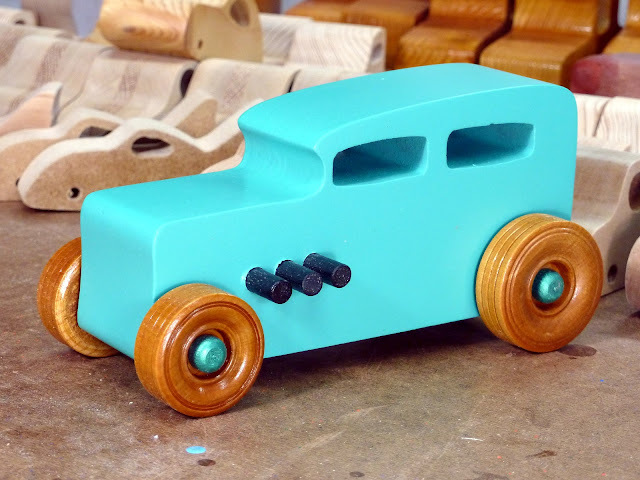 They get coated with glue when the wheels are glued on and the excess is wiped off. the glue dries clear effectively clear coating the axle ends. 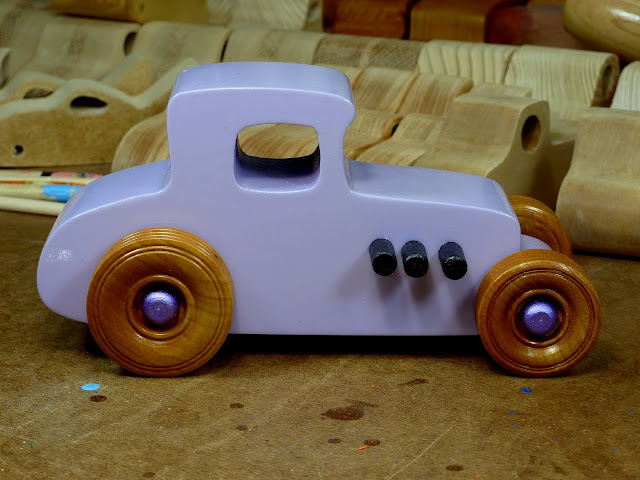 The wheels are finished with one heavy coat of amber shellac. 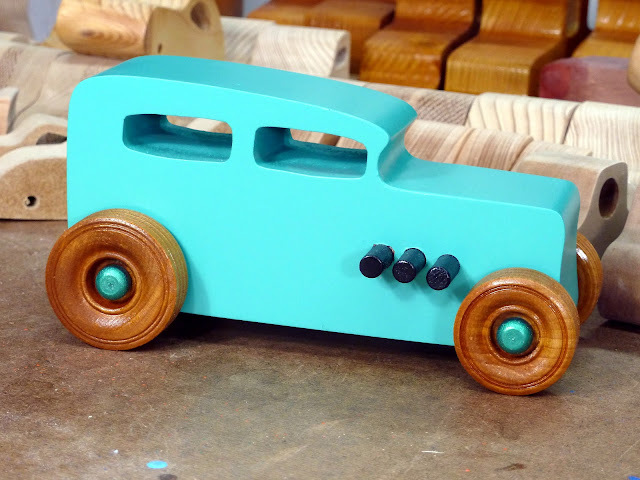 I mount them on a dowel and turn them with a drill while applying the shellac with a brush. I keep apply shellac until they stop soaking it up. 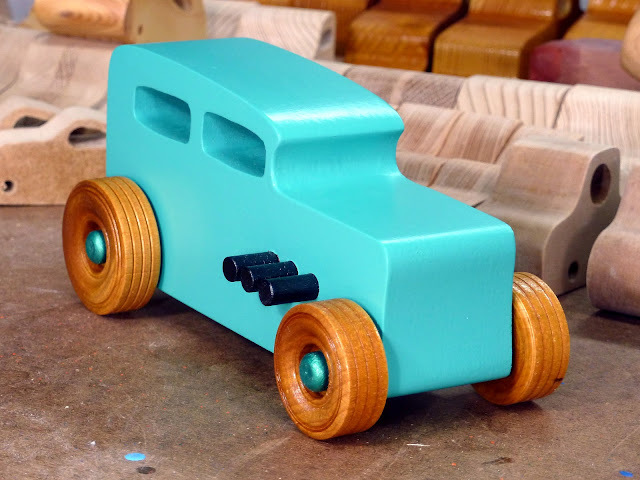 Some of the wheels will soak up an amazing amount of finish. 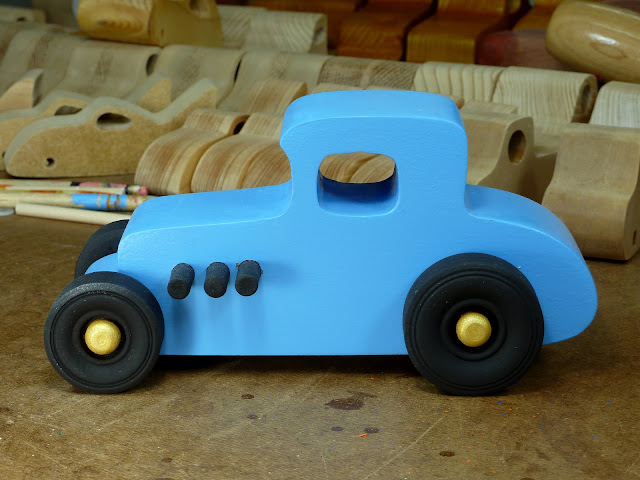 A scroll saw was used for the curved parts. I used my Shopsmith Band Saw to resaw 2x4 for the bed. A drill press was used to drill the axle holes. Most of the sanding was done by hand but I used my Shopsmith Belt Sander to smooth the flat surfaces on the cab. The bed was cut to length using a Shark Saw and the axles were cut with a Harbor Freight flush cutting saw.